Heat mustard oil in a pan and add the methi seeds and green chillies and let them sizzle in the pan for couple of seconds. Add the potatoes, salt and turmeric and fry it for 3-5 mins. Stirring it constantly so that it does not stick to the pan. The potatoes should be slight browned. Add the dried coriander leaves . Give it a stir and fry it over low heat for another 2-4 mins. 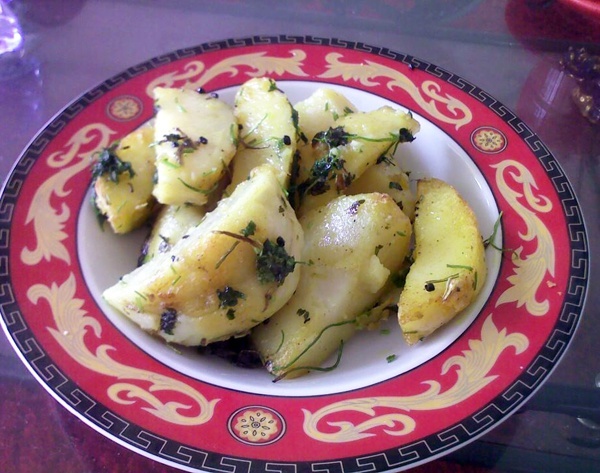 This entry was posted in All Recipes, Nepali Food Recipes, Snacks & Appetizers, Vegetables and tagged Nepali Cuisine, Nepali Recipes, Quick Food, Stir Fry Potatoes, Tareko Aloo by Kamakshi. Bookmark the permalink.